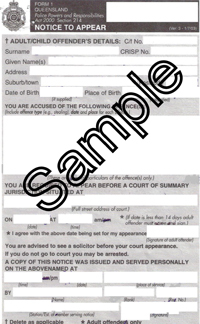 Under current legislation the Queensland Police Service is required to personally serve Notices to Appear on alleged offenders. This process ensures that the alleged offender is aware that they have been charged and the date upon which they are required to appear in Court. The service of Notice to Appear by ordinary pre paid post is fraught with danger. Currently the legislation permits service from Queensland Transport and the State Penalties Enforcement Register, by ordinary pre paid mail. There are almost daily examples of people who have not received such notices being pulled over for unlicensed driving and facing mandatory loss of licence of up to 6 months. Traffic infringement notices for offences detected by camera are now sent by registered mail, however under these proposed changes, offences requiring court appearances before a Magistrate will be sent by mail. A number of these offences can result in the forfeiture of a persons motor vehicle. A failure to appear will likely result in an arrest warrant issuing and the persons being arrested and held in custody for a traffic or street offence. People need to be vigilant in terms of maintaining their correct residential details with government bodies and ensuring that any concerns with the delivery of their post is resolved with Australia Post. If Postmen are to become defacto police officers, delivering Notices to Appear, then the QPS should at the very least be required to serve the Notices by way of Registered Post to ensure that service is effected. We are extremely concerned about these changes.